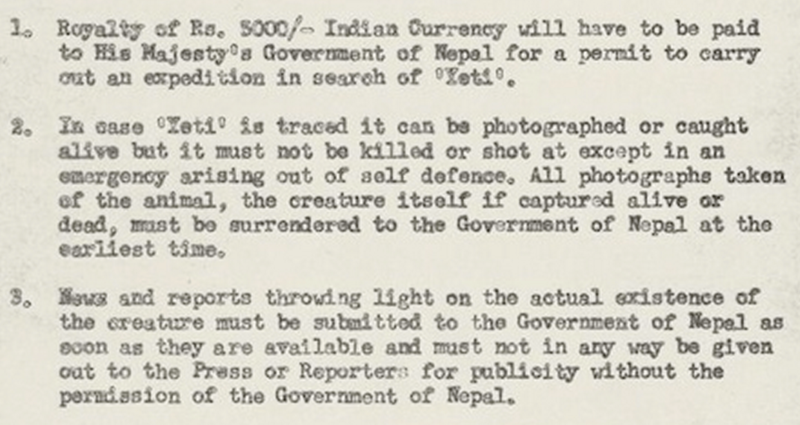 Apparently in response to a request from someone in Washington, in 1959 the U.S. Embassy in Kathmandu (yes, Bob Seger spelled it incorrectly) sent back this brief summary of the Nepalese government's "REGULATIONS GOVERNING MOUNTAIN CLIMBING EXPEDITIONS IN NEPAL—RELATING TO YETI." 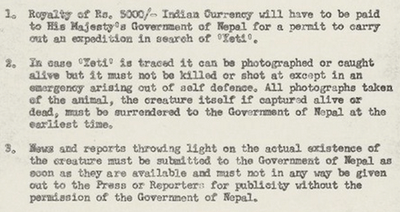 Most importantly, one may not kill Yeti "except in an emergency arising out of self-defense." It is possible, I suppose, to imagine other extraordinary circumstances in which it would be necessary and appropriate to use lethal force against Yeti. Were such an emergency to arise, I would examine the particular facts and circumstances before advising you on the scope of your Yeti-killing authority. Boing boing has the full document (via Anorak).